Ciro (right) and his former apprentice, Nilton (left), smile as they show off their welding workshop in West Africa. Ciro attended the WAVS Vocational School so he could grow his business and provide for four orphaned children. For years, Ciro Gomes earned a meager living as an auto body repairman — patching up old cars so they could keep chugging along the streets of West Africa. He had never received formal training as a welder, so he mostly just figured things out through on-the-job experience. Eventually, his clients started asking him to take on other welding jobs, such as building metal doors, windows, and security bars. The new work would mean more income, which he desperately needed. Ever since his sister had passed away a few years ago, Ciro had been responsible for her four orphaned children. Ciro had never received any formal training as a welder. After studying at the WAVS Vocational School, he was able to grow his business by taking on more types of welding jobs. But these new jobs required technical skills he didn’t have. Ciro realized he was in over his head and needed help. Ciro had heard about the WAVS Vocational School’s welding program and knew it had a good reputation. Maybe that’s what I need, he thought. Ciro (right) and Nilton (left) work on welding together a door for a client. Both West Africans studied at the WAVS Vocational School to expand their skill sets so they could take on more types of welding jobs. Today, Ciro’s putting his new skills to use. The training helped Ciro so much that he encouraged one of his apprentices, Nilton Gomes, to enroll in the welding program, as well. After Nilton completed the course, he was selected by the school to stay on for a one-year internship in the welding department. Nilton graduated from the WAVS Vocational School’s welding program and was later selected for a one-year internship at the school. He’s now back at his workshop, using the new skills he learned. Today, Ciro’s shop takes on many types of welding projects. He’s come a long way from just doing auto-body work. This story was written by Chris Collins, WAVS Executive Director. Sergio, center, welds together a piece of metal at a the local welding shop where he works. A few years ago, Sergio was unemployed and only made a few dollars here and there from working odd jobs. Determined to escape a life of poverty, he enrolled in the WAVS Vocational School’s welding program. How do you help a young man like Sergio, who grew up in one of the world’s poorest countries? Handouts like free food and clothing are quick and easy ways to give to the poor. But they also create dependency and aren’t long-term solutions. Sergio needed more than a quick fix. His only source of income was the few dollars he made here and there by helping out his neighbor, a mason, with occasional jobs. At this rate, he would never be able to escape a life of poverty. Sergio, standing at the far left, with his classmates at the WAVS Vocational School in Guinea-Bissau, West Africa. After graduating from the course, the school selected Sergio to stay on for a one-year internship in the welding department. Following the internship, a local welding shop hired him. Today, Sergio’s life is much different. Today, Sergio earns a steady income working at a local welding shop. Before enrolling in the WAVS School, Sergio had never touched a welder. But during the nine-month course, Sergio learned the basics of welding theory and gained lots of hands-on experience. Later, through his internship, he learned how to invoice customers and take on custom jobs by working on projects for the school’s clients. The school’s welding department takes on projects from clients in the community for two reasons: To give its students real-world, practical experience; and to generate revenue for the school so that it doesn’t need to rely on outside funding as much. As much as Sergio has worked hard to get to where he is today, he still gives God the credit for his success. 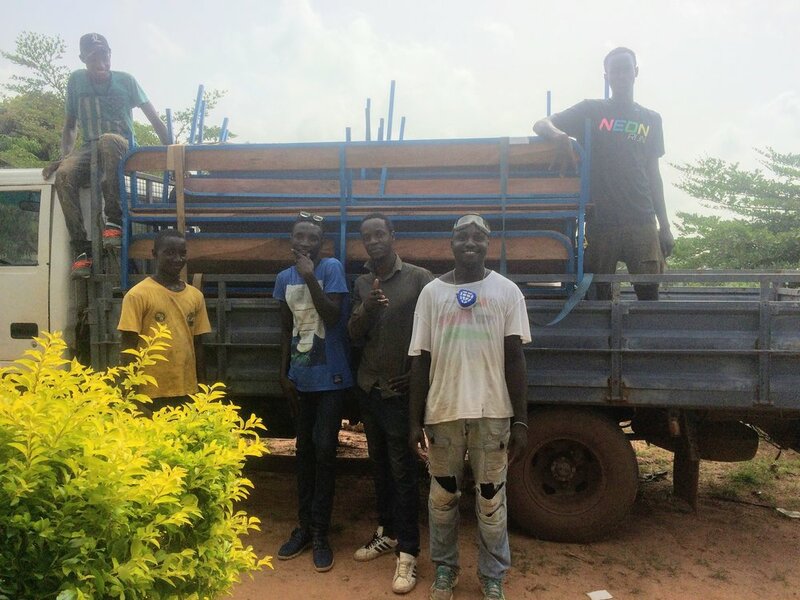 WAVS Welding graduate Erickson Sanhá smiles as he shows off some of the 70 school desks that he and his fellow graduates were hired to build for a local school. After graduating from the WAVS Vocational School’s welding program, Erickson Sanhá was ready to set up his own shop. But without start-up capital, how would he buy tools and supplies? And without a power grid in town, where would he get electricity and space to work? And without business experience, how would he know how to invoice his customers? Overcoming poverty, it turns out, is complicated – but not impossible. 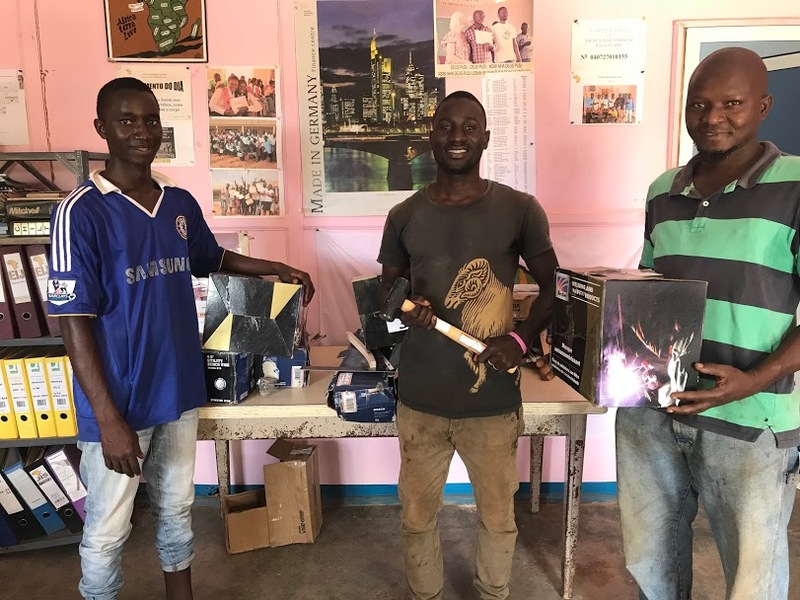 Erickson received a set of welding tools through the WAVS New Entrepreneurs Program after completing a one-year internship in the WAVS Vocational School’s welding department. WAVS donors gave Erickson that opportunity. After completing the nine-month welding course, Erickson went on to work as an unpaid intern at the school. In return, the school rewarded him with a set of welding tools last year – just what he needed to strike out on his own. Today, Erickson and two of his fellow graduates are growing their small welding business. Recently, they built 70 desks for a local school run by a church in town, which also provided them with a generator and workspace. They’re also finishing up a set of custom-made security bars for a client’s home – a job that will earn them about $200. Erickson displays the security bars that he’s building for a client’s home. Erickson puts a lot of emphasis on quality. Erickson and his fellow graduates finish painting one of the 70 desks a local school hired them to build. During his yearlong internship in the WAVS welding department, Erickson spent a lot of time working on projects for the school’s clients. The welding department takes on these projects for two reasons: To give students real-world, hands-on experience; and to generate revenue for the school so that it doesn’t need to rely on outside funding as much. Through his internship experience, Erickson learned how to invoice customers, track materials, and take on custom jobs. Those practical skills, along with the set of tools he received through the WAVS New Entrepreneurs Program, set him up for success. “After my internship, which gave me even more experience in this type of work, I wasn’t afraid to take on any job,” Erickson said. Poverty. Corruption. Government dysfunction. The woes of West Africa add up. Vasco, 25, graduated from the WAVS School’s computer course in 2011. He went on to enroll in a six-year medical school program in Guinea-Bissau’s capital, Bissau. After he graduates this June, Vasco plans to work as a pediatrician in his country, where nearly 1 out of 10 children die before their fifth birthday. Between med school classes, studying for exams, and serving as the vice president of his church’s youth association, Vasco also teaches computer classes at a private high school — a job he got with the help of his certificate from the WAVS computer course. He earns about $1.40 for every 45-minute class. It’s just enough to cover his daily living expenses. Vasco lectures at a private high school in Bissau. His teacher’s salary helps him cover expenses while he finishes up med school. While at the WAVS School, Vasco learned how to use Microsoft Office programs and how to access the Internet. After he enrolled in med school, he discovered that many of his classmates didn’t know how to use a computer – a basic skill necessary to complete med school. He became their unofficial computer instructor. 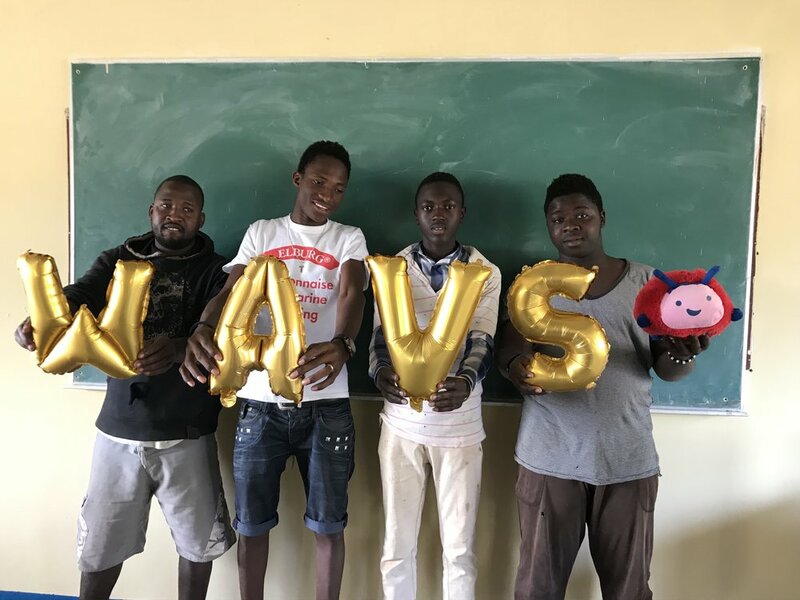 Vasco, center, while he was a computer student at the WAVS School. This photo was taken in April 2011. A few years after starting med school, Vasco began his job teaching computer classes at Escola Brandão, a private high school in Bissau. In Guinea-Bissau, where public schools often shut down for months at a time because the government fails to pay its teachers, private schools have become increasingly popular. Tuition is minimal. At Escola Brandão, a tiny campus with cramped classrooms tucked into a crowded neighborhood in Bissau, students pay about $15 per month. The school receives no outside funding, so its teachers’ salaries are similarly small. The private school in Bissau where Vasco teaches. Still, what the school lacks in funding and basic supplies, it makes up for with energy and enthusiasm. At one of Vasco’s classes on a recent afternoon, Vasco animatedly explained the different uses of Microsoft Office programs to a dozen 11th graders. He illustrated his points using a projector that shined onto a bedsheet hanging on the wall. Guinea-Bissau desperately needs a new generation of hard-working, educated leaders. If the country is to change anytime soon, it will be because of people like Vasco and the donors who gave him the opportunity to succeed. This article was written by Chris Collins, WAVS Executive Director. Vasco’s students eagerly crowded together for a group photo after class. We’ve got the Travel Bug. His name is Gus. Editor’s Note: Meet Gus. He’s a big, red, fuzzy, stuffed bug with his own Instagram following. For the last few years, he’s worked at the WAVS office in Fresno. Why do we keep him around? Probably because he always has a smile on his face. IT’S NOT EASY BEING A STUFFED BUG — ESPECIALLY WHEN VISITING WEST AFRICA. 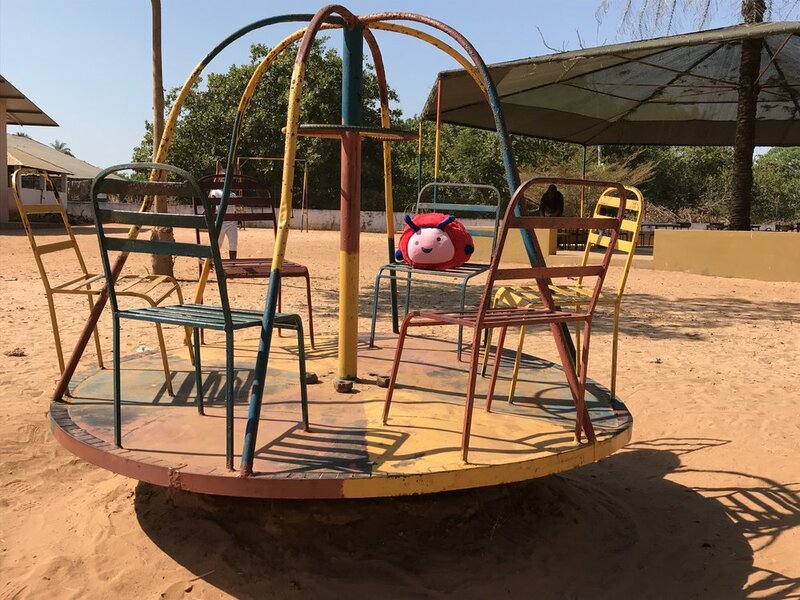 Ever since the WAVS staff found me abandoned at a fundraiser a few years ago and adopted me as the WAVS mascot, I’ve waited patiently for my chance to visit Guinea-Bissau. This January, my co-workers finally invited me to come with them! We’re off to West Africa! As soon as I arrived at the WAVS School, I ran into some challenges. For one thing, I’m really, really short. About eight inches tall, to be exact. So when the welding instructors were demonstrating to their students how to bend and cut metal, I couldn’t see past the crowd of students. Thankfully, one of the students propped me up on a table so I could get an up-front view of the welding lesson taking place. Before I knew it, I was the center of attention. Definitely posting this pic on my Instagram. Keep those sharp tools away, please. My fluffy skin tears easily! Another problem with being a stuffed bug is that I’m basically one giant head – with little stubs for hands. So the welding students wouldn’t even let me hold a stick welder. They said I couldn’t grip it right and that their safety gloves were too large for me. I’m glad I got to watch them practice their welding skills, at least. I was impressed with how much they could do with just a stick welder and some simple tools! The students showed me some tiny stools that they made to sell to people in the community. The proceeds from the sales go back to the school, which helps cover expenses so the school doesn’t have to rely on outside funding as much. The stools were the perfect size for a bug like me! Selfie time! The students also take on many other projects for the community. They even made playground equipment for a local primary school, which I tested out myself. I was too excited to whirl around on the merry-go-round to pay much attention to anything else. At 1lb 8 ounces, I’m just glad I didn’t go flying off! The next morning, we visited the rest of the school. I buzzed in and out of the classrooms, admiring the brightly colored walls and greeting everyone I met with my trademark smile (people say the only time they’ve seen me frown was when I was left upside down in a storage bin for a few months! 🙃). I became quickly convinced that we have the best teachers in the whole country! Did you know that Cirilo, the welding instructor, is also a musician? He’s already released his first album. You can bet I jammed out to his tunes the whole trip. My new friend, the WAVS English teacher, Moise. Marfam, the French teacher, speaks five languages. That’s five more than me! I was so inspired by Marfam’s knowledge of languages that I decided to try to learn a little bit of the local Creole, a Portuguese-based language unique to Guinea-Bissau. Mattheus, one of the school’s guards, led a Creole lesson one morning. It was hard for a little bug like me to remember all the words, but Mattheus was a patient teacher. Some of the phrases, like kuma ku bu sta? (how are you?) and obrigado (thank you) were useful when I talked with the students. I tried really hard to remember those phrases – but when your brain is 99% synthetic cotton, it’s not easy! That afternoon, we met up with Dauda, the computer basics instructor. He invited us to sit on plastic chairs behind his house and drink warga. Dauda is the warga master! Have you ever heard of warga? It’s a kind of sweet green tea that people drink in the afternoon while they socialize. Dauda taught me how to make it. The tea is mixed with a lot of sugar and then poured back and forth between two small glasses, a process which caramelizes the sugar and creates a frothy layer on top. The same tea leaves are used to make three rounds of tea, with sugar added each time. I think I liked the last round best because the tea was not quite as strong, but still sweet! Parabens! … That’s how you say “congratulations” in Portuguese and Creole. I got lots of practice with that phrase at the WAVS School graduation ceremony we attended on the first weekend of February. I sang and danced along as Cirilo brought the crowd to their feet with his Creole worship music. I cheered for every one of our 23 graduates! About halfway through my trip, I suddenly started feeling a little light-headed. Something wasn’t right. Was it just me, or was I losing my stuffing? Thankfully, my co-worker, Rebecca, took a look. Sure enough, I had a three-inch tear on the back of my head! Not sure how it happened, but I’m just glad the injury was spotted in time. Despite the gaping wound, I stayed positive and kept smiling at everyone I met. My teammates made sure the tear didn’t get any worse. Finally, after arriving back in the states, Rebecca stitched me back up. Now I’m as good as new and already counting down the days until my next trip! In the meantime, I’ll keep posting pics of my trip on Instagram. You can follow me here. And see you all at the next WAVS fundraiser! P.S. Here are some more photos from my trip! For seven years, Nilton Gomes worked as an apprentice at a small welding shop. But he was mostly given odd-jobs and didn't receive much real training. At this rate, Nilton knew he would never be ready to start his own shop. So in October 2016, he enrolled in the WAVS School’s welding program. Nilton quickly discovered that he had been missing out on a lot. Nilton’s teachers recognized his skill, strong work ethic, and positive attitude. After completing the nine-month welding course, they invited Nilton to stay on for a second year as one of the program’s three welding interns. Nilton working on a truss for a roof the welding students built. The welding department had recently started the internship program to help keep up with the growing demand for its services. There were more project requests coming in from clients in the community than the department could handle with just its students and teachers. The interns not only gain valuable work experience, but they also generate revenue for the school so that it doesn’t have to completely rely on outside funding. In June, Nilton completed his internship and has received a starter kit of welding tools through the WAVS New Entrepreneurs Program. Nilton plans to open his own welding shop in the future. His older brother, who had encouraged him to study at the school, is helping him find a generator so he can make his dreams a reality. Left to Right: Erikson, Nilton & Sergio receiving their starter kits through the WAVS New Entrepreneurs Program. This holiday season, we invite you to Spark Opportunity for a future welding entrepreneur. Your gift today will help train 20 young people, like Nilton, in the next school year with the skills they need to provide for themselves and their families — for the rest of their lives. Qualifying graduates will also receive welding starter kits through the WAVS New Entrepreneurs Program. WAVS has partnered with the nonprofit One Day's Wages to raise $30,000 before the end of the year to train new welding students. One Day’s Wages will match every donation made through December 31 — dollar for dollar — up to $15,000! They are ready. Give them the opportunity. Rumario: To provide for his ailing uncle and 8 others in his family, this young man became a welder. 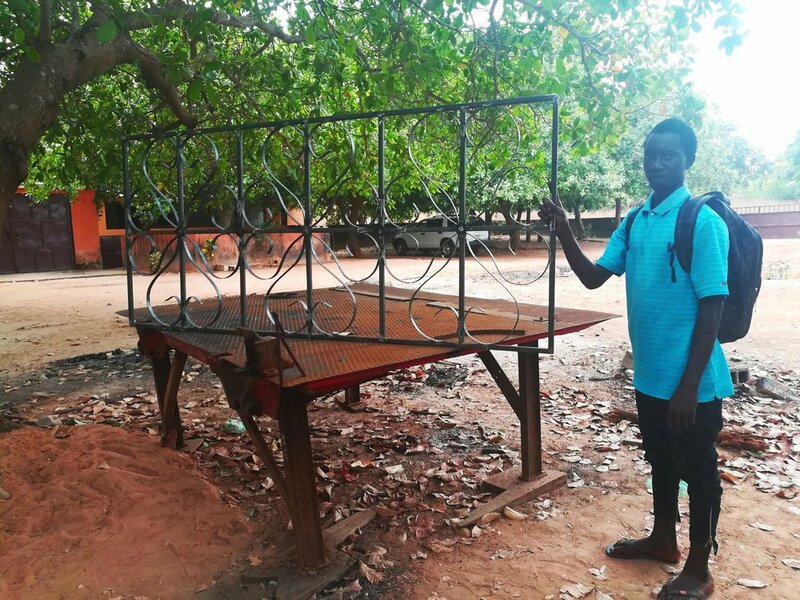 Rumario started out welding like most other young people in Guinea-Bissau who want to learn a trade skill: He found someone who’s already working, and watched and learned. In West Africa, these informal internships are common. But they have many shortcomings, including inconsistent quality and a lack of tools to practice with. Rumario’s extended family of nine people – including an ill uncle – were relying on him to provide for them, and the internship wasn’t cutting it. Rumario knew he could do better. One day, he came across a local welder named Papa Mendes who was doing impressive work. Papa told him that he had learned how to weld at West African Vocational Schools (WAVS). So Rumario enrolled in the nine-month course at the WAVS School. He worked weekends and evenings to pay for his tuition. And thanks to WAVS Teacher Sponsors who help cover the cost of the welding course, the fees were affordable for Rumario – less than $10/month. The training was exactly what Rumario needed. After graduating in 2016, he opened up a makeshift workshop. Rumario said the quality of his work has improved dramatically. “They come to me to do their work because they see that I do quality work,” Rumario said. Rumario also benefited from the WAVS New Entrepreneur’s Program (NEP), which allowed him to purchase new tools at a discounted price. He said the tools have helped improve the quality of his work and attracted more clients. Rumario shares his adobe brick workshop with a local carpenter. It sits on a main road next to the town’s transit center. He pays for his share of the electricity to run a generator. 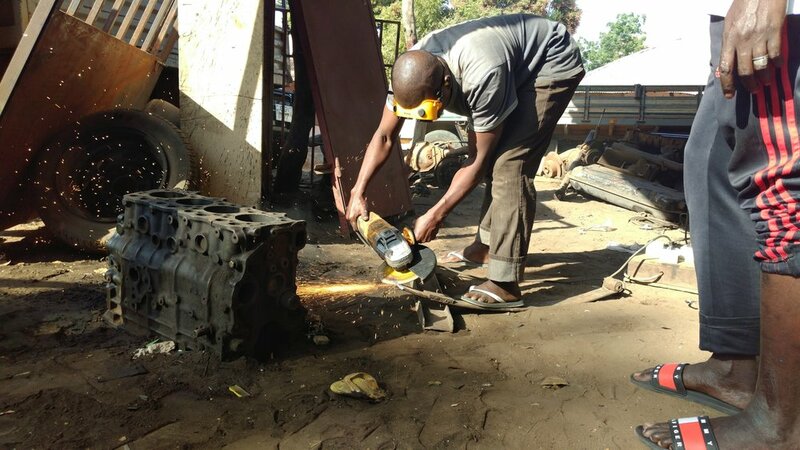 With the steady income from his workshop, Rumario and his brother, a mechanic, are now able to provide for their extended family. And Rumario doesn’t want to stop here. “I’ve learned a lot, but my dream is to learn more,” he said. Each student pays tuition for the courses they take, but this only covers about 25% of the total cost. The remainder of the costs are covered by generous donors like you. By sponsoring a teacher at the WAVS School, you help cover the costs of the teacher's department and open up new opportunities in life for young people like Rumario. Bruno's dreams evolve with his education from the WAVS School. Bruno at the small thatch-covered roadside shop where he works. As a little boy in Guinea-Bissau, Bruno would sit in class daydreaming of one day becoming a famous soccer player like the ones pictured on the front of a notebook he brought to school every day. But when he would get home, Bruno’s mom would push him out the door to go learn from the auto mechanics in the shop across the street while she struggled to support her family by raising pigs. She wanted her youngest child to have the practical job skills she knew he would need in order to survive in Guinea-Bissau, one of the poorest countries in the world. Bruno, now 22, is thankful for his mother’s tough love. “I’m really happy my Mom knew better and encouraged me to do this,” he said. These days, such engineering jobs are hard to come by. Following the 11-year war for independence, the expulsion of colonial powers, a civil war, and ongoing governmental power struggles over the last 30 years, not much infrastructure is left in the country. Reliable electricity is virtually non-existent. But Bruno has found a way to make the most of the life he has been given. Recently, he completed an auto mechanics course at the WAVS School and he now works for a friend in a small thatch-covered roadside shop not far from his childhood home. When I visited him earlier this year, I found Bruno leaning over an engine he had opened up and was meticulously rebuilding for a client. He proudly told me that “all the machines I have worked on now are still running, I am good at this work. My parents would be happy to see me working now”. When he enrolled in the auto mechanics course, Bruno had never actually opened up an engine, despite his years as an informal apprentice at the shop outside of his childhood home. At the WAVS School, though, he gained the hands-on experience and training he needed to start working for clients. I watched Bruno work away. Piece by piece, the engine came back together under the hands of one of the country’s newly trained mechanics. It seemed to be a metaphor for the larger work of rebuilding Guinea-Bissau that WAVS envisions for the country. Today, Bruno has new dreams. He hopes to move to the capital, Bissau, and work in one of the larger mechanics shops that offer a good salary. With his new diploma in hand, this is now more possible than ever before. Bruno can now dream of a future where he can use his skills to earn a good salary. You can equip young people like Bruno with the skills they need to provide for themselves and their families -- for a lifetime. Each student pays tuition for the courses they take, but this only covers about 25% of the total cost. The remainder of the costs are covered by generous donors like you. By sponsoring a teacher at the WAVS School, you help cover the costs of the teacher's department and open up new opportunities in life for young people like Bruno. Fatherhood awaits 'Papa.' But how will he provide for his family? PELUNDO, GUINEA-BISSAU – He’s gone by the name “Papa” his whole life, but soon he’ll be a father for the first time. Papa Mendes, 32, and his wife are expecting their first child in a few months. But in Guinea-Bissau – one of the world’s smallest and poorest countries – providing for your family isn’t easy. The education system is in tatters; the economy is fragile; and steady jobs are rare. That dream didn’t come easily. But Papa is determined. Every morning, he rolls off a thin, plastic mat that passes for a bed and walks out of his 10-by-10-foot mud-brick room. Outside, about 20 feet away under a shade tree, he lays out a handful of tools on a metal table, cranks up a generator, and goes to work. Papa is the village welder. It’s not a glamorous job, but Papa couldn’t be happier. Papa grew up in a tiny village. Every spring, he and his family would harvest cashews from the trees that surrounded their village and sell them. But cashews – Guinea-Bissau’s cash crop – are an unreliable source of income. The weather, environment, and global markets are constantly in flux. One year, the harvest would bring in enough cash for Papa’s family to survive the next 12 months; the next year, it would leave them destitute. After his father died in 2011, Papa was determined to find a more reliable way to provide for himself and his family. He heard a radio ad about welding classes at the WAVS School in Canchungo, a town just a few miles from his village. The cost of the class was affordable – less than $10 a month. He immediately signed up. With his quick smile and positive attitude, Papa was quickly elected by his fellow welding students as the chefe de alunos – the student representative for the class. Papa had never held a welding torch before, but over the next nine months he learned how to transform steel rods and metal sheets into chairs, tables, doors, and windows. After graduating, a Portuguese businessman hired Papa to work at his welding shop. In February 2014, I went to visit Papa at the workshop. He smiled and eagerly shook my hand. There was no hiding his enthusiasm. In a country like Guinea-Bissau, it was quite the accomplishment for Papa to go from an unskilled and unemployed young man to a working professional within a year. It seemed like life was moving in the right direction. But a few weeks after I visited Papa, the businessman folded up his workshop and returned to Portugal. Soon, Papa was back among the mass of young, unemployed women and men in Guinea-Bissau – a country where half the population is less than 18 years old. 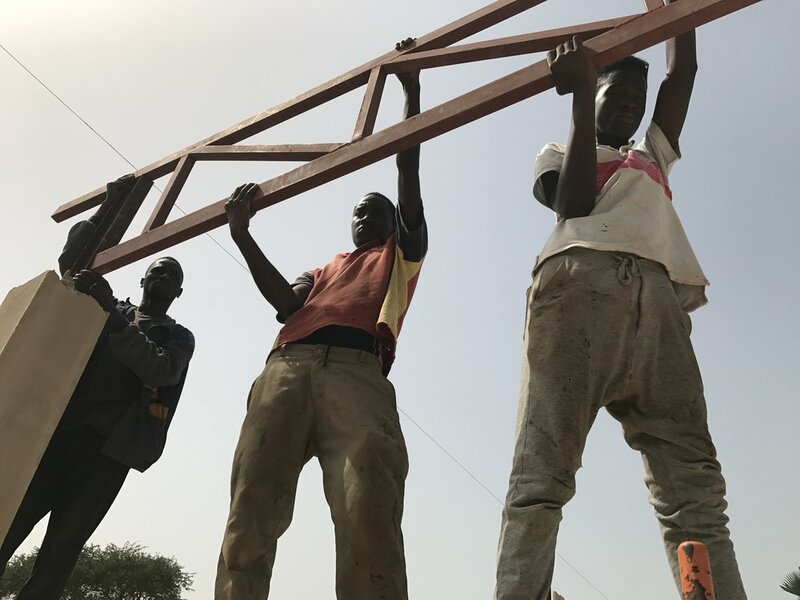 So like many young people desperate for a job, Papa moved to the capital, Bissau, where food and rent are more expensive, but there’s a better chance of employment. He connected with a friend who had a small outdoor welding workshop. For the next three years, Papa welded doors, windows, gates and anything else that customers brought to him. But for Papa, who longed for the village life, a career working in the capital city was not his dream. Three years later, Papa had finally saved up enough money for his own welder and generator. Last August, he moved into his tiny, mud-brick room in Pelundo, and opened his shop along the main road. Today, Papa is passing on his knowledge to others. A few weeks after he opened his shop, a man walked up to him and asked if his nephew could work as Papa’s apprentice. Papa said yes. When I visited Papa, his apprentice was assisting him while a few villagers sat on a nearby bench and looked on. In sleepy Pelundo, Papa’s workshop passes for entertainment. With a steady stream of work coming his way, Papa is now earning an income that will allow him to care for his wife and child, as well as help support his mother, who still works in the cashew orchards. The journey hasn’t been easy and the future is unpredictable, but Papa is ready to face it head-on, always with a smile. Papa's success story was only made possible because he was given an opportunity and he made the most of it. You can equip young people like Papa with the skills they need to provide for themselves and their families -- for a lifetime. Each student pays tuition for the courses they take, but this only covers about 25% of the total cost. The remainder of the costs are covered by generous donors like you. By sponsoring a teacher at the WAVS School, you help cover the costs of the teacher's department and open up new opportunities in life for young people like Papa. Despite resistance from his family, Ronaldo is pursuing an education — and his faith. Ronaldo (left) with some of his friends at the WAVS School. Ronaldo grew up in a small village called Tame. A few times each day, a truck rolls through the village on the dusty road that serves as the community’s only lifeline to the outside world. If you can catch a ride, a bumpy journey through the forest takes you to the town of Canchungo. Ronaldo made that trip when he was 16 so he could attend high school in Canchungo. 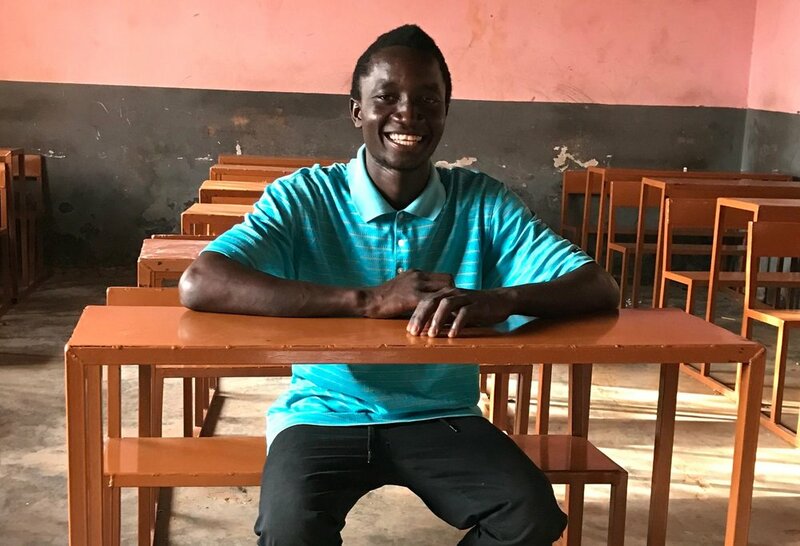 After enrolling, he heard about the WAVS School – the only school in Canchungo providing job-skills training – and he signed up for its computer basics class. He enjoyed the class so much, that he also enrolled in the school’s English class. Ronaldo has had to work hard to keep up his studies at both his high school and the WAVS School. His mother didn’t go to school and doesn’t understand why he’s enrolled in so many classes. “It’s still difficult to convince my mother of the importance of school,” Ronaldo said. His family has also resisted Ronaldo’s decision to become a Christian. Some have even threatened him if he doesn’t renounce his faith. But with the support and encouragement from staff and students at the WAVS School, Ronaldo continues to hold firm in his decision to follow Christ. Now a level 3 student in the English program, Ronaldo is quickly becoming a fluent English speaker with the help of his teachers. He said that the English classes at the WAVS School, which are two hours each day, are much more effective than his high school English classes, which were 45 minutes twice a week and lacked the quality of teaching and materials available at the WAVS School. In the future, Ronaldo wants to go to the capital city, Bissau, to study to become a lawyer. We invite you to give more students like Ronaldo the Gift of Education with a year-end, tax-deductible gift. This gift will help train 100 students with life-changing job skills in the first semester of 2018. Each student pays tuition for the courses they take, but this only covers about 25% of the total cost each semester. The remainder of the costs are covered by generous donors like you. Help us raise $10,000 by December 31 to cover the remaining costs of the courses for these dedicated students. Any amount you give will help reach this goal! A significant advantage for the students in the welding program at the WAVS School is that they get practical, hands-on welding experience in addition to their classroom instruction. The school is often hired by businesses and residents in the community to do projects for them. This real-life experience teaches students the value of doing quality work and allows them to hone their skills for future employment. The revenue from the work also helps offset the cost of the program since the students' tuition only covers about 25% of the total cost of the program. This last semester, the welding program was very busy with projects! Even with classes for this semester now complete, many students have chosen to come to the school while on vacation so they can continue working because there are still projects to be completed! Church Benches: These benches were made for a church in Cadjens, a small village about 30 minutes outside Canchungo. Security Gates: This is one of the most popular and common items that the students build. They are used to cover windows so they can be left open at night, enclose verandas so that these open-air porches are secure or build a fence around a house or compound. This specific gate was for a woman in the community named Ines, that everyone calls Dona Ines, which means Grandma Ines. 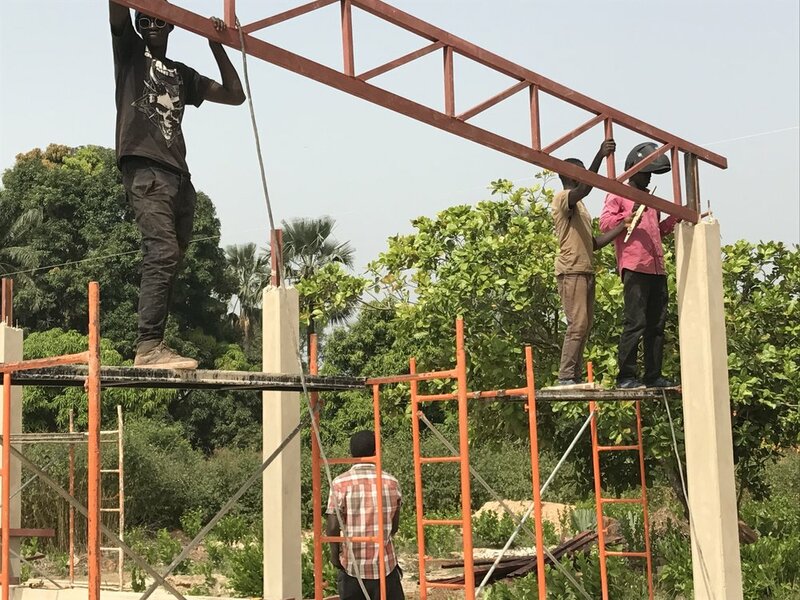 Roof for local agriculture co-op: The roof was part of a project to build a cashew drying warehouse that was built just down the road from the school at a local co-op called COAJOQ. The project was commissioned by Steves JC, a large engineering company that is also building the new parking complex at the national airport. Steves JC commissioned these same cashew drying warehouses in different regions around the country. The WAVS School was the last contractor to get a contract, but was able to finish the roof faster than the other four roof contractors. The Steves JC foreman said that the roof the WAVS students built was the best in quality. This holiday season, you can help equip more welding students with life-changing job skills. We invite you to give the Gift of Education with a year-end tax-deductible gift. This gift will help train 100 students in the first semester of 2018. Each student pays tuition for the courses they take, but it only covers 25% of the total cost. The remainder of the costs are covered by generous donors like you. Help us raise $10,000 by December 31st to cover the remaining costs of the courses for these dedicated students. Any amount you give will help reach this goal! Deusa's WAVS story: How her education gave her new opportunities and hope. Deusa was nervous. It was her first day at the WAVS School’s computer basics class and she wasn’t even sure how to hold a computer mouse. But she was confident that she would learn. After all, her friends who graduated from the WAVS School were now able to speak English, conduct research using the Internet, and create PowerPoint presentations. She imagined how much better she could do her job as a local radio journalist if she, too, had those same skills. “The reason why I enrolled was because I saw that the students who studied there succeeded and are now using their skills,” Deusa said. Six months later, Deusa completed her course. A computer mouse no longer intimidated her. Now, Deusa is able to type up her stories to be read on the radio instead of writing them out by hand. She is also able to search the Internet for news and report it to her community. And thanks to her new Excel skills, Deusa was also hired to help keep track of a United Nations school-feeding program in surrounding villages. Every day, she collects data from the villages and returns to her office to enter the information into her spreadsheet. The education that Deusa received at the WAVS School has given her new opportunities and hope. This holiday season, we invite you to give students, like Deusa, the same opportunity. Help us train 100 students with life-changing job skills in the first semester of 2018. Each student pays tuition for the courses they take, but this only covers about 25% of the total cost each semester. Help raise $10,000 before the end of December to cover the remaining costs of the courses for these dedicated students. Any amount you give will help reach this goal. Thank you to the 550 guests and volunteers who made the 2017 WAVS Dine & Discover West Africa Dinner Banquet such an amazing night! Working together, you helped raise $148,230 to equip young women and men in Guinea-Bissau with life-changing job skills. Thank you for your incredible generosity and investment in the future leaders of one of the world's smallest and poorest countries. We'll see you next year! Hard-working volunteers who helped prepare food, set up tables, decorate, and serve at the banquet. Lili Mané is the director of the WAVS School and he's proud of what the school has accomplished in the decade it has served the town of Canchungo. "The courses we are offering have a lot of benefit for the community," Lili said. "It's the only center here in the town of Canchungo that offers this kind of training, so the students can learn to do something in their own villages or towns. ... A lot of people who were trained here in auto mechanics or welding are now working and taking care of their own families." But Lili also knows that the school's impact goes beyond equipping students with job skills. The school also serves as a platform for its Christian teachers to invest in the spiritual growth of their students. "The WAVS School believes that to train somebody just to have skills is not enough; it's goal is also to bring people to Christ," Lili said. "That's why in the first 10 minutes of class, we share the word of God, pray together and help each other." Watch Lili's full interview in the video above. Lili and his staff are able to invest in the lives of WAVS School students thanks to Teacher Sponsors who help keep tuition affordable while allowing the school to grow and improve every year. 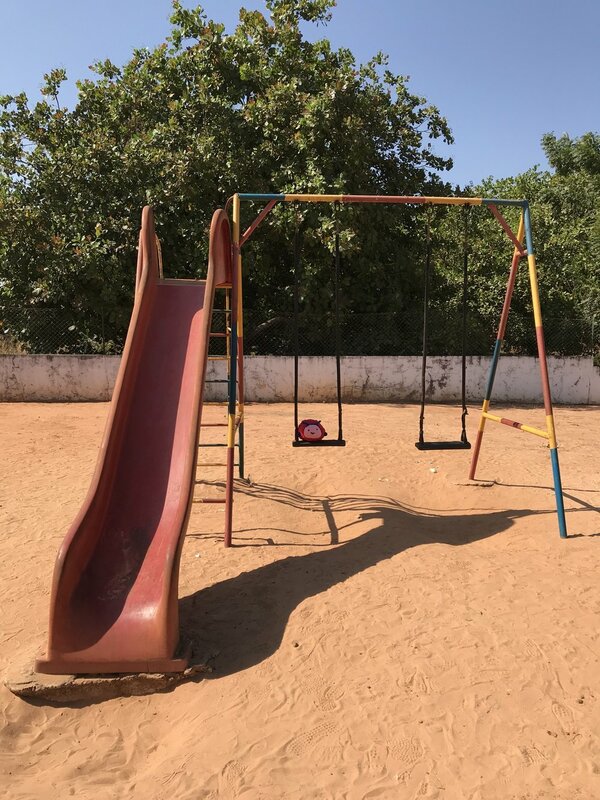 Today, you can sponsor a WAVS School teacher and give young women and men in Guinea-Bissau the opportunity to lift themselves out of poverty using their own skills and abilities. Thank you for making the Wine Tasting & Food Truck Fundraiser a success! Thank you to the 135 guests and volunteers who joined us last Friday to enjoy a relaxing evening at Kings River Winery (near Sanger) while supporting the WAVS welding program. Together, we enjoyed delicious food, local wine, and a live performance from violinist Patrick Contreras. And you helped raise more than $4,700 to help make it possible to train more WAVS welding students like Agusto. Thank you! We also want to give a special thanks to the three people who became WAVS Teacher Sponsors to help grow the WAVS welding program. Don't forget to reserve your seat for the 5th annual WAVS Dine & Discover West Africa Dinner Banquet on Oct. 6 at Engelmann Cellars (10 minutes west of Highway 99). Get your tickets here. Starting the morning off with devotions. Class starts at 8 a.m. sharp for the WAVS welding students. Many of the students have been awake since 6 a.m. preparing for the day. There are no bowls of Wheaties or stops at Starbucks to grab a latte before class, but instead the students eat rice with sauce heated up from the night before or bread with either chocolate spread or tuna for breakfast. All of the students walk to school; most of their walks are 10 to 20 minutes in length. Very few people in Guinea-Bissau have a personal or family car so walking or riding a bike are the main modes of transportation within Canchungo. Upon arriving, the students are greeted by both Cirilo, the head welding teacher, and Amona, a second welding teacher. Amona leads the students in a brief devotional first thing each morning sharing a verse or passage from the Bible and reflecting on how the verse is relevant in their lives. On the weekends, Amona is a pastor at a small church in a nearby village, Djita. Today, the students are focused on Proverbs 1:4. After the devotional, the students begin their welding theory lesson for the day. Welding theory covers different types of welding; different types of welds; equipment names, parts, and how to use them; as well as basic welding safety. Surprise! Today there is a pop quiz! But the students don’t even flinch as they feel well prepared from the previous theory lessons to ace the test. Putting the finishing welds on a large metal gate. After getting some welding theory under their belts, the students are ready for some hands-on practice. Students gain experience both through specific projects geared to help them practice a certain skill they have learned and also through real-life production projects that people in the community bring to the welding production department throughout the week. Today, the students are working on completing a large metal sliding gate for the entrance of a neighboring nonprofit organization. Jason showing the students a new machine. Once a week, students get a lesson from Jason, the WAVS welding program mentor. Jason gives them lessons and exposure to some machines, tools, and techniques that are less common in Guinea-Bissau, such as the plasma cutting table, tube bender, or how cast iron welding is done. 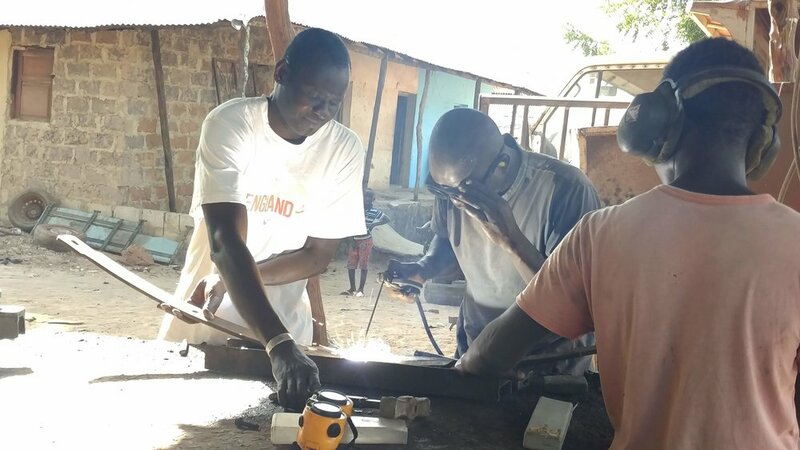 While many of these practices may not be common in other welding workshops throughout Guinea-Bissau, the students are exposed to the types of equipment and techniques that are available. Welding students installing a fence at a home in Canchungo. Most of the welding takes place at the school. But for several of the larger jobs, there is some onsite installation involved. Here the students are installing a fence around the compound of a community member’s home. Welding a community member's wheelbarrow. After a long day of welding theory and practice, the students are ready to head home, but just because the students head home doesn’t mean that the welding production comes to an end. Amona stays at the school and continues to take small jobs from community members until 6 p.m. Many of these smaller jobs include small welds on bicycles, motorcycles, or motors. The WAVS welding program is equipping students each day with the skills they need to go out and start a successful welding business of their own. The teachers are not only equipping them with knowledge of welding but they are also imparting life skills as they lead by example. In addition, the production side of the welding program is an important link to the community. Many people first hear about the WAVS School and the various programs it offers through hearing about one of the welding projects the school has done in the community. We are grateful for the quality teachers that we have in the welding department and are so proud of our students for all the work they are putting into their studies. Keep up the great work!